How to take a wealth of original content and turn it into a scalable digital product. Sparkle Stories came to us with an incredible wealth of original content and a loyal, international following of committed parents and families. Families who had seen the magic of these stories in the development of their children, as well as their daily family lives. At the time, they were limited to one-off audio book purchases, and an online store that was antiquated and not mobile-friendly. The process for simply buying a series and getting it onto a device to play in your car or in the home was cumbersome and involved. How can we take what we know is proven content and a captive audience, and remove the barriers to entry? How do we convert the people we have from one-off to return customers? How can we develop an infrastructure and business model that can truly scale? We began with a technology strategy phase, in which we developed a complete understanding of Sparkle Stories business model and operation, evaluating the business case for the pivot to a streaming subscription model service, and developing forecasts to assess the impact of the transition on the bottom line. Simultaneously, we conducted comparison research across the universe of services required to stand up the platform which would need to be built to realize the shift to streaming. At the conclusion of this phase, we provided a complete report including our own analysis of the business model shift to streaming, as well as the technology infrastructure required to run the new Sparkle Stories platform. Develop a user-centric design to meet the needs of Sparklers worldwide. 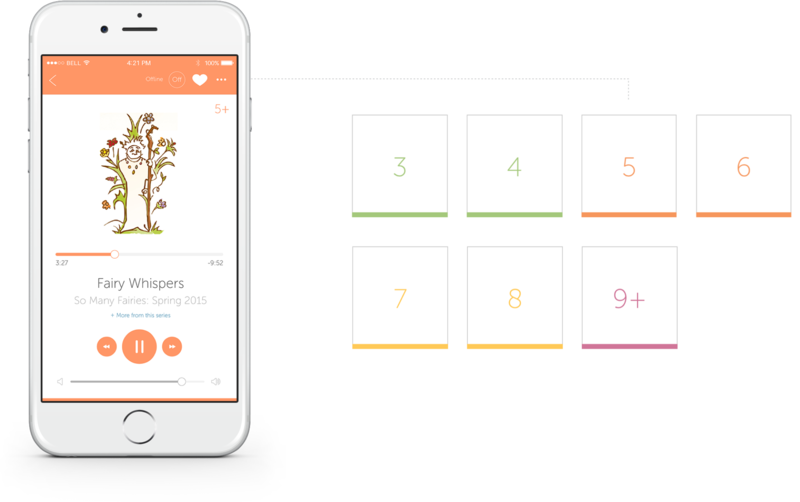 Beginning with a responsive web app and a companion iPhone app, our team developed a comprehensive design language to guide adults and children alike through the apps, while simultaneously developing new features to help Sparklers adjust to the new streaming model. We added new features like search and favoriting to allow users to save stories, collections, and series for future listening. And by incorporating Sparkle Stories’ existing illustration schema, color wayfinding for different age groups, and a new layer of topics as a method for searching and browsing stories, we created a highly visual and engaging experience engineered to meet the needs of Sparkler’s diverse array of users. Create a digital infrastructure, built to scale. Leveraging existing technology solutions wherever possible, we built the 1.0 Sparkle Stories web and native app infrastructure to meet the core needs of users while delivering the content, billing, and user management capabilities and required to run a platform of this size. In the first year after the initial launch, Sparkle Stories saw a 254% increase in conversion rates, as well as an 81% increase in active users month over month. Support and develop the platform over time. 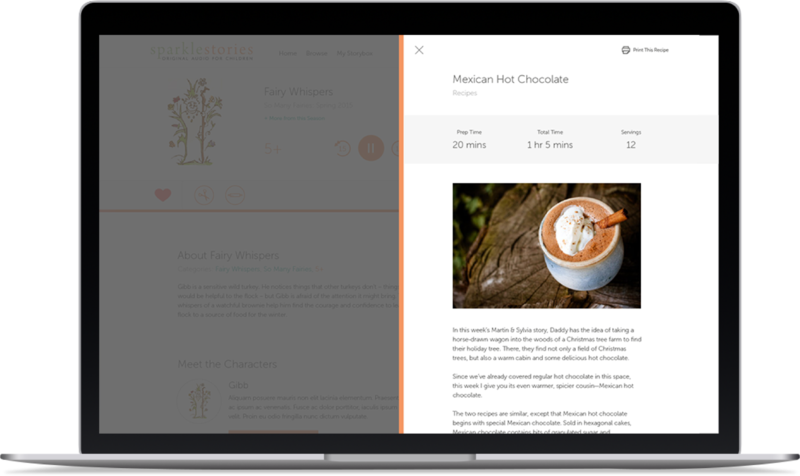 Since the 1.0 launch in December, 2015, the Sparkle Stories web and native apps have grown in features and functionality, while also being continually improved from a user experience and optimization perspective. Sparkle Stories now serves a global community of listeners across the web and native iPhone app, with the Android and 2.0 iPhone app coming fall, 2017. 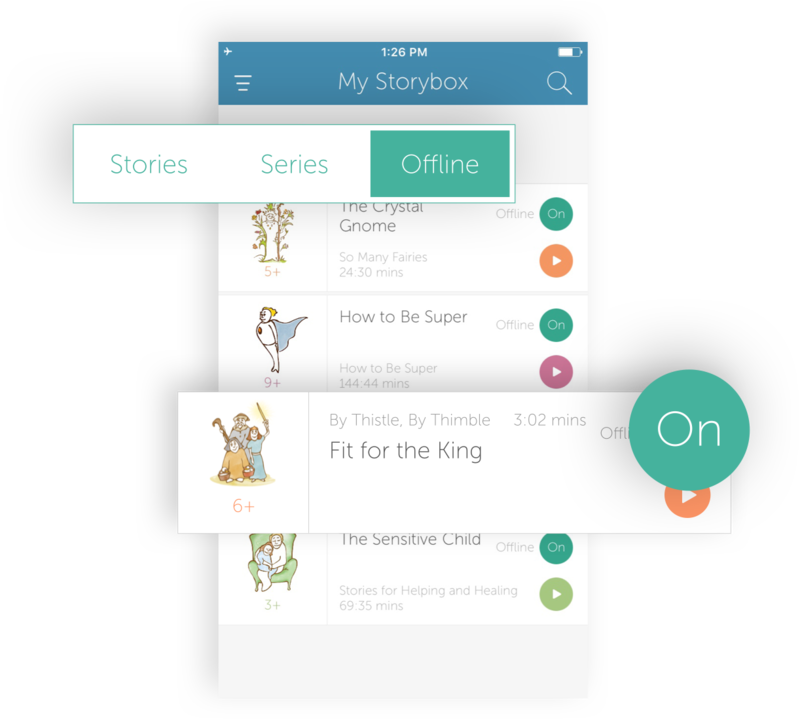 Due to the developmental psychology behind Sparkle Stories content, stories are categorized by age to ensure content is appropriate for the age of your children. 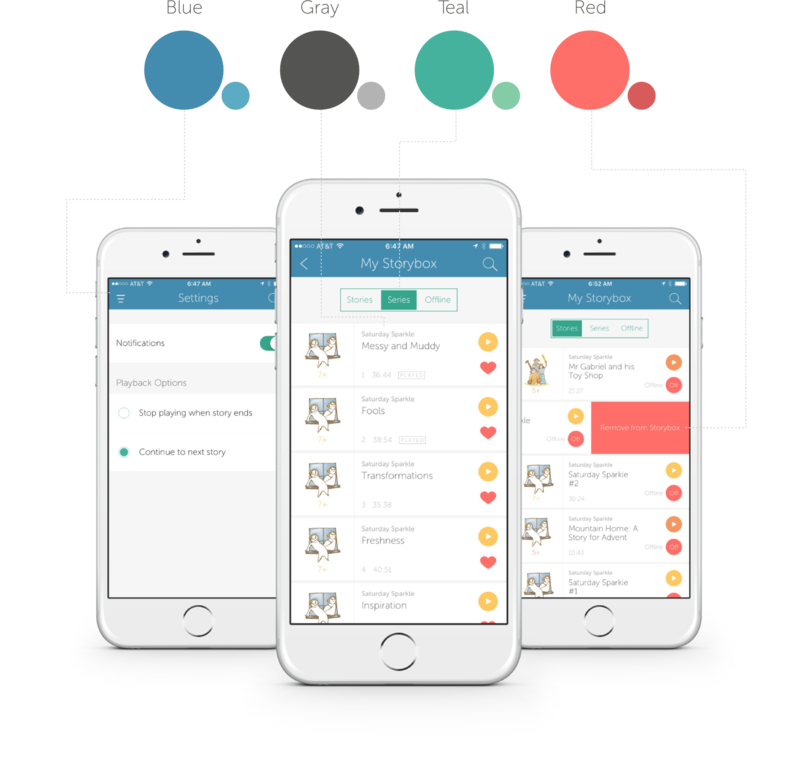 Our challenge was to create a color palette that both provided a clear system of visual wayfinding, while also providing the necessary colors to achieve effective baseline user interface design. Whether on a plane or deep in the wilderness, offline listening ensures Sparkle Stories listeners never miss their bedtime story. Each story is accompanied by recipes, crafts, and activities design to enrich the learning experience.